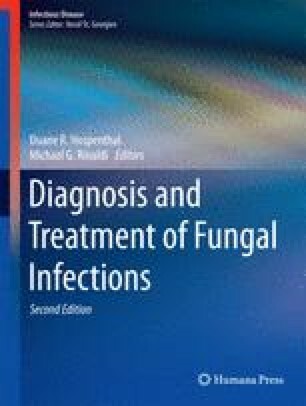 Coccidioidomycos (CM) is a fungal infection caused by the endemic thermal dysmorphic fungal genus Coccidioides. The illness is usually acquired in the southwestern USA and adjacent areas of Mexico. Primary infection is virtually always pneumonic disease. Disseminated disease may occur in individuals with antecedent pulmonary disease or as a presenting manifestation. Dissemination can occur to any site, but disease of skin, bone, joint, and meninges is most common. Therapy is complex, often protracted and less than ideal. The primary agents are azoles and amphotericin compounds. Relapses are common. The authors wish to thank D. Caldwell, J. Pusavat, and the recently deceased H. Einstein for their help and/or advice in the preparation of this chapter.